​Today is Ash Wednesday, the official start to the Lenten season. Lent is comprised of the forty-six days leading up to Easter. 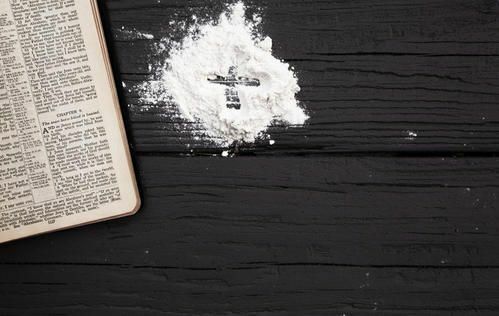 The discussion of when Lent began and who actually started it has varied over the years. Traditionally, Roman Catholics and many Protestant churches have celebrated the season of Lent, although not all participate in the “ashes” on Ash Wednesday. The ashes on Ash Wednesday serve to remind people of their sin and their need to repent. Lent also serves as a time of fasting for forty of the forty-six days. Ash Wednesday, historically, was a solemn day for people to receive the ashes and not do much else but pray and fast. It is recommended that people not do much outside their home that day, and if possible, wash the ashes off before going out in public. So as evangelicals, what are we to do? Do we celebrate Lent? What if your church doesn’t celebrate Lent or participate in Ash Wednesday or Maundy Thursday? Are we, too, to fast for forty-days? Why does it matter? I grew up in a Protestant denomination that participated in Lent, but did not do the ashes or the fasting components. I do remember it being a somber season in the church with varying color changes of the pastor’s robe sachets, as well as the colors on the altar. I remember different liturgical readings and the weeks of Lent being mentioned. I vividly remember Maundy Thursday and Good Friday services. But do you know what, it had more of an obligatory feeling to me than an understanding. My heart wasn’t in it because my heart didn’t belong to Jesus. As I sit here pondering the question, “Why should evangelicals participate in Lent,” the question arises, “Why not?” How much emphasis and excitement do we have Thanksgiving through Christmas proclaiming the Savior’s birth to the world, yet we barely gain momentum in the evangelical Church a couple weeks before Easter when we are reminded to invite “the lost” to an Easter service. Our commission is to reach the world with the Gospel, but at the same time, we also need to remember to water our own personal relationship with Jesus. If you or I participate in Lent because our church tells us to, we are doing it for the wrong reasons. It is not commanded in Scripture. However, is it wrong to participate in a solemn season of prayer, contemplation and fasting? Never. In fact, as I quickly discovered this past Christmas, the season of Lent is a slower season for most of us. Maybe your life—like mine—is already quickly spiraling out of control this year and it is only February! What better way to slow things down and concentrate on Jesus this season. What about fasting? If you do choose to give something up, that’s fine, but choose something that is important to your growth in Christ—not just something frivolous like chocolate or soda. Alcohol – I know many choose to give up alcohol during Lent. I think this is great because it brings clarity to your everyday. And if you use alcohol as a crutch, why not turn Jesus into your crutch and run to Him when you are tired, stressed, or going through withdrawal. I believe you will be amazed how much better Jesus is than alcohol. I’d also challenge you to not drink on Sundays (go the whole forty-six days, not just the forty non-Sundays). Television – Okay, maybe this is asking a lot for some of you, but what if you only gave up television in the evening (or some other time your viewing hours are high)? Imagine if you replaced your television time with reading the New Testament. You could certainly read the entire thing in forty days. Think how much more you would discover about Jesus by reading the entire New Testament (or even just the Four Gospels)? Perhaps the Cross will mean something so different for you this Easter. Social Media – Do you reach for social media when you are bored or lonely? How about reaching for the Bible, a Lent devotional or a Christian book about a topic you are struggling with instead? Relationships - Do you put more emphasis on dating or friendships than on Jesus? We must learn to prioritize who is first in our lives. If you have found that your relationship priorities are a little out of whack, you might want to fast from some relationships this season and figure out a way to put Jesus back to number one. Spending – This is a hard one for most of us, but what if you did a spending fast? Clearly we need basics to survive, but I am talking about things that aren’t as important—think daily Starbucks runs, stops at fast food restaurants, weekend shopping trips, etc. Most of us hold on to our money a little too tightly…especially when we are being asked to give, and we say we don’t have the money. However, forty days of re-evaluating spending might be a surprise to many of us (myself included) and allow us to give and love more like Jesus. At the core of Lent, we must remember that we have a High Priest who died once and for all as payment for the sins of the world (Hebrews 10:12). Once we accept Him as our Savior, our sins are forgiven at that moment—eternal life is a gift that is given to the one who accepts the gift; it cannot be earned through works or association with a church or denomination…it’s a personal choice we all must make (Ephesians 2:8–10). And as believers, we are still going to sin…day after day. We should take our sins and our repentant hearts straight to Him through daily prayer. We do this not because He takes His promise of eternal life from us when we do sin, but because our hearts need to stay ever present and focused on His holiness so we do not stumble and cause others to stumble. Never can it hurt to focus on Jesus for forty-six days. The reality of what He did culminates on Easter when we hear, “He is not here. He is risen!” (Luke 24:6) in our church services. Christians of all denominations will hear these words. How much more will they mean to those who have purposefully considered the Savior for forty-six days? How much greater will your relationship with Him be after you Sit At His Feet for forty-six days straight? Prepare your hearts for those who will be open to hearing about this Savior for the first time in their lives this Easter. There is a hurting and dying world that needs to know His grace and His love. Take this season to replenish yourself with His grace and His love for you, as well. Still looking for a non-denominational Lent devotional? 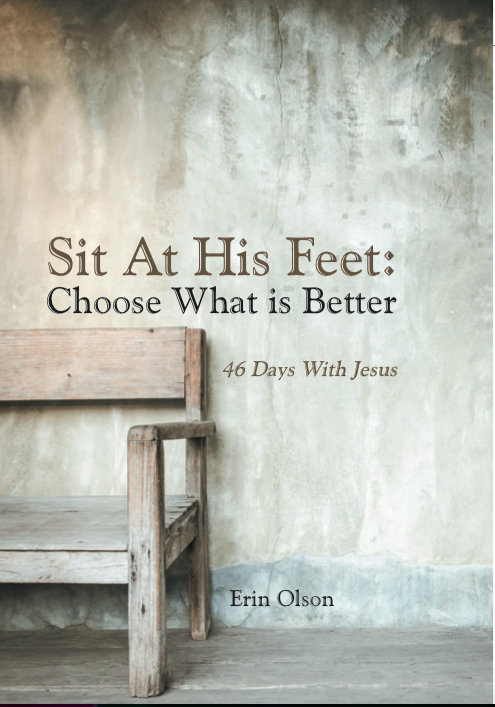 Check out Erin Olson's Sit At His Feet: Choose What Is Better. Available in print and e-book versions. Click HERE for more information.